We’ve seen the app store go through a lot of changes over the years, but this could be the biggest one. I really didn’t think there would be a day when I would make a post like this, but I’ve been researching, analyzing, and talking to successful developers… so I’m going to come out and say it. App Store Optimization (ASO) is dead. To create any successful business you need two things: traffic and conversions. This is true regardless if you’re a SAAS company like Buildbox, a car company like Tesla or if you make mobile games. In theory, conversions are pretty simple. You have to have a great product and some system to convert that product into dollars. With mobile games, this has always been either a premium or freemium business model. Either charge the money up front, or make money with ads and in app purchases. Pretty simple, but the traffic side of the business? Not simple at all. When I started in 2010, there wasn’t a lot of competition in the app store. My first game, which was OK, but not amazing, got featured by Apple. If you got featured on Touch Arcade, you would be in the Top 100 games. I could email my newsletter list and break the Top 100 of a game category. Now, that might seem like the “golden years”, but that’s not really true. While it was easier to rank, it was also a LOT less people on mobile devices. This year, Apple announced it had sold 1 billion iPhones. Not only that, including iPad, they have over 1 billion different devices currently active. That is insane. To put that in perspective, in 2010 when I started there were only 42 million iPhones sold. Now let’s discuss traffic, because this is the real lifeblood of any business, and it’s always been sketchy when it comes to apps. There has often been some sort of short lived “secret” that people would figure out and run as hard as possible until it quit working, and typically this worked around ASO. In 2010, people got traffic from Apple features or outside sources like press mentions or email lists. Again, it was easy to rank then, but less upside because of so few people on mobile devices. 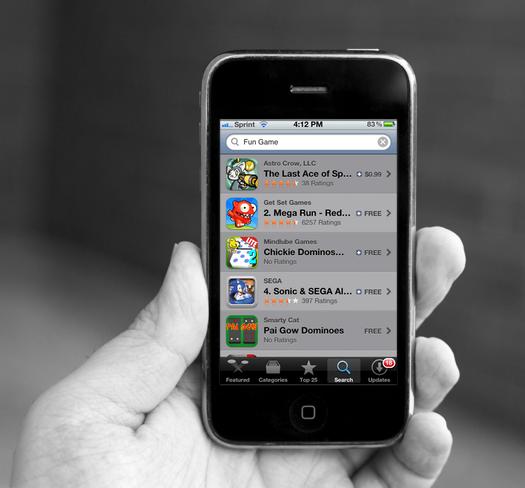 In 2012, people started figuring out App Store Optimization (ASO). This started earlier, and used to be called App Store SEO, but this is around the time it really took off. If you’re not familiar, ASO is simply showing up in search results in the app store. If you can figure out how to rank #1 for “running game”, then your running game is going to get a lot of downloads. Around this time is when people started figuring out tricks. For example, we found out that for a short while Apple was ranking the developer’s company name higher than anything else. If you made a company called “Best Game, Inc”, then you would rank #1 for the extremely competitive keyword “best game”. We also found out if you named your app a single name with a period after it, that you would rank #1. I had a game called “Games.” and another one called “Music.” and ranked #1 for both terms. To be clear, I didn’t make these up, as a community we were all figuring it out and sharing. The problem is, it turned into a game of cat and mouse. None of these tricks work anymore and Apple was constantly trying to shut down the loopholes it created. They took this very far the past few years making insane changes to the way search works on iPhone. In 2016, Apple continued to make changes until they completely killed App Store Optimization as a business model. At the time of this writing, I do not personally know a single person who is significantly growing a mobile game business based on ASO. Even the people who had legacy rankings (i.e. they ranked high for terms in 2012) have slipped down the search results. This proposed a major problem for developers. App Store Optimization is how I got my first 10,000,000 downloads, and was the de facto way for indie entrepreneurs to make it in the game market. Now we’re in 2017. This is a new era, and as typical in these situations, a few other options have risen up to take place of the falling model. Yes, App Store Optimization is dead. It’s a crowded market that now gives the games on top even more leverage, but this does not mean it’s the end for the indie game owner. In fact, it’s the opposite. I’m happy to say our business is growing faster than ever and the new model that has replaced ASO for us is here to stay. It’s actually consistent, which App Store Optimization never was for us. Before I explain exactly what we’re doing, let me show you every option that is currently working for people right now. There are a few things that work right now in the mobile market. Some are harder than others, but I’ll list them all out below, then explain what we’re doing (as well as our most successful customers). We’ve seen a lot of people doing well by either hiring or partnering with social influencers. Obviously there are the really big deals done with Kim Kardashian, but this has also worked out on a smaller scale. We’ve seen people partnering with Vine (RIP) stars, Instagram famous people and more. It’s a good approach if you have a big following, are great at networking or don’t mind spending some money to promote your game. This is a tough one to base your business on, but I do know one person, who is not a publisher, who does it. He literally has built a business solely based on getting featured. The key here is to first meet someone from the editorial or business development team, and then make sure to add as many new features to your game as possible, and create polished products. Even then though, it’s a bit of a lottery. If you can somehow make yourself desirable – and have Apple or Google chasing after you – then you have a real strong shot at getting lots of features… but again, easier said than done. The final option you have to get traffic is also the most consistent one. The only other option that might match it in consistency is partnering with a social influencer, but that largely depends on the outside success of the influencer themselves overtime. Diversification – You’re not locked down to one single source (Apple Feature) or the monetary value of a market (buying installs). Just like every other major media market, there are many publishers to choose from and the list is only growing. Creation Guidance – We create games by analyzing what is working for publishers. This vastly helps us decide what to create, and ensures that we have at least a decent shot of the game doing well (we don’t always hit home runs, but we almost always make it on base). If you get featured, partner with a celebrity or buy installs, you are pretty much on your own. There is no roadmap to follow or guidance on what you should make. Ease of use – Not having to worry at all about the marketing has been a huge stress relief on our company. I used to stay up all night trying to figure out the latest ASO hack when we would get delisted. Now we just focus on one thing: Making good games. Most importantly, it’s been the most consistent way to grow a game business that I have ever seen. This is how every Buildbox customer who is crushing it has dominated the App Store. In fact, 70% of the games on our All Star list were published. Great article, but is there a follow up on “how to get published”? Thanks! Thanks for the info Trey! Can you do a blog post about publishers? we In fact trust you and the research You do and the experience You gained is FAR MORE than many of us had. Off course I’m still able to make some games and publish them with “zero” marketing but still making little money. But always had this doubt Whether ASO techniques still work ??? I’m now pretty sure its no more effective as you opinion matters…a lot. thanks very much for your article and your concern to help all of the small developers like us from AUCKLAND Nz to belive in new stratergies that are active and not to end up in fantasies and illusions. We are only using ASO for our games, and we got 5 million installs so far in about 3 years. And we are still getting good downloads as well. I agree some of your points like social influencers etc but ASO has its own worth as well, You can’t say its totally dead. Hi Babur, thanks for the input. What you have done is amazing, and this post is in no way meant to invalidate that. If anything, it’s a testament to how smart you can run a business. I knew this post would be controversial, and I discuss it even more on the event we’re having tomorrow. The thing is, I do not legitimately think that someone can start a large business (the size you can with publishing) on the iOS App Store right now with ASO. The keywords there is START a business. I know some existing businesses have translated, but most of the people reading this article are new. Also, I am not stating that it’s impossible to generate any revenue right now with ASO. Instead, my point is it’s not a viable business model for newcomers if they want to grow a massive business, which people are doing right now with publishing. Will there be the exception to the rule? Always. Does it make the post invalid? I don’t think so at all. If 99% of the mobile game developers are having success with the new model, it’s worth paying attention to. Great article. Thanks, Trey. Looking forward to our event. I could use the help for my app Newsmeister. Thanks for the info Trey, it seems everywhere rankings are moving away from SEO techniques and more towards engagement, as always looking forward to your event. Well ASO is still alive, I have my business running on my ASO techniques only,at $0 advertisement costs. Hi Syed, I can only post on my personal experience here, but I did talk to many industry guys before submitting this article. The general consensus I got is on iOS, no one knew of anyone actively GROWING a mobile game business with ASO. There were some people who had existing legacy rankings from older apps, but these were slowly falling down the ranks and were not increasing in value. There were also people going after very small niches, but again, this was not sustainable and growing. From my research, ASO drastically pales in comparison to even one year ago, and most people who are finding a lot of success are not using these tactics. Does that mean that there is no one building a business with ASO? Absolutely not. I don’t know every developer, and I’m sure there are things going on I don’t see. Regardless, from my experience, networking and discussions, ASO is not in a healthy state and pales in comparison to where it was even just one year ago. CAN YOU PASS ON ME YOUR EMAIL SYED …just wanted to know how ASO IS STILL WORKING FOR YOU. Thanks for sharing, Trey. Looking forward to Wednesday. hello i am from srilanka and i like to see this crush event if you like can you pleas tell me will you post event videos?